On a snowy day in McCall, doctoral student Micah Russell flies a drone around a snow-laden tree. It may look like a game, but Russell’s work is part of an effort to improve estimates of water availability on Northwest landscapes, funded in part by an Earth and Space Science Fellowship from NASA. Snow pack is critical to spring water supplies. Historically, water from snow has been estimated by combining measurements of snow depth on the ground and snow density. This method misses one big area: snow caught in forests on tree limbs. This “intercepted” snow can contribute to streamflow or be blown away, but until now, there has been no easy and reliable method to measure it. Over the past two winters, Russell has been working with Assistant Professor Jan Eitel to develop a model that can be applied to large forest spaces to predict just how much snow is stuck in the trees. 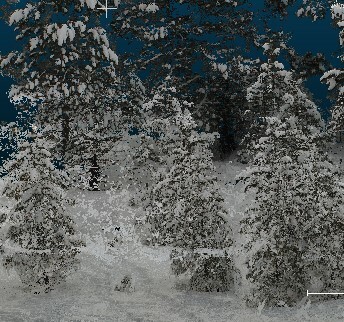 The most accurate method for testing the model involves measuring snow on trees with terrestrial lidar, which uses lasers to create 3D point cloud images of a target measured down to a millimeter, first of trees without snow and then with snow. However, the process is so time consuming only about twelve trees can be analyzed in a day. Using drones, which create 3D point cloud images down to a centimeter, could accelerate the process immensely. A drone can fly a large span of forest in 30 minutes, making it more feasible to measure vast areas. Plus, drones can fly into places that are either logistically impractical or dangerous to send researchers. This winter Russell and Eitel will be using both terrestrial lidar and drones in their research. The hope is that when they compare the data, there will be sufficient correlation that drones could be the sole tool used to obtain measurements in the future.